Views like this one were meant both to entertain and inform the armchair tourist. The text on the back of the view offers educational information about the oyster industry in America: how oysters are caught and processed, and the place of the oyster harvest in American fish and seafood production. 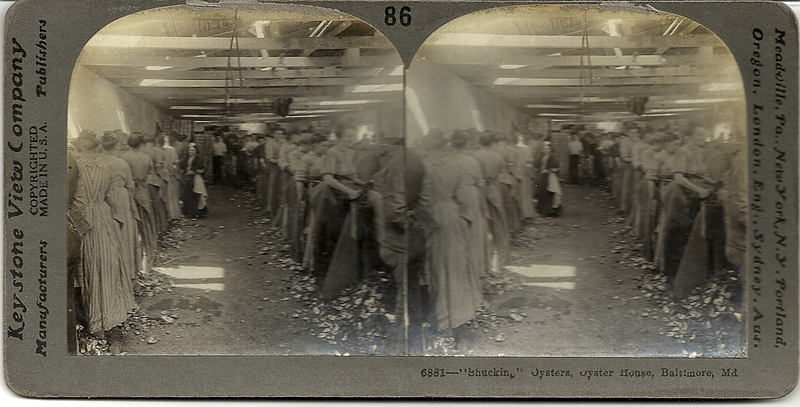 Yet, as Johnson documents in “Sloppy Work for Women: Shucking Oysters on the Patuxent,” “historically, shucking oysters was considered a menial, dirty job, typically relegated to the poorest people. In Maryland, this meant immigrants, women, blacks and children” (38). After 1865, thousands of white women, most of foreign birth, worked as shuckers in Baltimore. As was typical in an oyster house, the women stand in wooden stalls, in a cold, damp building, probably for 12 hours a day, six days a week, for a dollar or two a day, depending on one’s speed and skill. These women wear rubber aprons, but are using their bare hands to slice open the wet, muddy shells. In order to bring the meat out intact, and thus get the best money, one had to learn how to slice through the muscles of the oyster without cutting the meat. Once removed, the meats were placed in separate buckets according to size. Empty shells are tossed at their feet for removal. Shuckers brought full buckets to a counter between shucking and packing rooms for rinsing, grading and weighing. Tallies were kept on a chalk board. Because each oyster is unique, shucking resisted mechanization. No inventor was ever successful in designing a machine that could do what the human shucker could do. Johnson’s essay can be found in the 1988 volume for which she served as editor: Working the Water: The Commercial Fisheries of Maryland’s Patuxent River (Charlottesville: Calvert Marine Museum and the University Press of Virginia Press). In addition to several essays, this invaluable book contains photographs of 148 implements and other kinds of equipment used in the Patuxent fisheries, from knives to water craft, as well as numerous images of watermen and others in the industry at work.